The Baltur Application Engineering Department supports customers by carrying out feasibility studies for special burners for all non-standard applications, both for large industrial plants and for small thermal power generation systems. The Baltur Application Engineering Department is the first and most important technical reference point for the entire sales force, both internal and external, at all stages of the process: pre-sales, feasibility studies, commissioning and start-up, directly in the field. The Department proactively participates in the pre-sales stages of all burners, both standard and non-standard, irrespective of power output (from 30 to 40 kilowatts up to 40 megawatts) while also dealing with even the most complex requests. The team, led by Alessio Visentin, is made up of professionals with high profile skills - two Application Engineers, a Customer Engineer and a Commissioning & Technical Support Engineer - who are engaged in technical analyses, feasibility studies, design work, economic assessments, commissioning and start-up. The team is also involved in the production of all the documentation relative to the plant and the spare parts (technical diagrams, instructions manuals, etc.) that are provided with the final product to support the activities of the sales network. 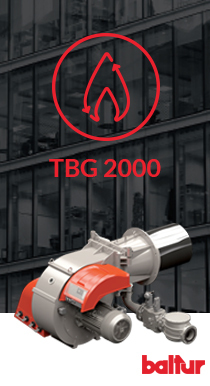 It also assists customers with the design of FGR systems (Flue Gas Recirculation) and in the implementation of solutions for reducing NOx emissions. «Our mission - explains Alessio Visentin - is to define, promote and guarantee efficient and effective technical, design and engineering solutions, which ensure that our customers receive full satisfaction to their requests and that at the same time minimise development, design and production costs in keeping with our business philosophy while maintaining high performance and quality standards that make Baltur stand out from its competitors». The Application Engineering Department is the primary technical reference point for the sales network. It plays a transversal role in the company, maintaining relationships with all departments - research and development, marketing, planning and production - and external customers. It liaises between the outside world and Baltur. «We operate at 360 degrees, both internally and externally, with a very broad range of skills and a strong commercial awareness. This enables us to handle all situations that might arise in negotiations and above all build a relationship of trust». Visentin’s team gains trust by providing effective Customer Care during pre-sales activities, through its skills, experience, flexibility and its willingness to carry out on-site testing, to travel abroad and its short response times. Our ability to respond to market requirements derives from our specific expertise in the technologies applied to the products and our thorough and detailed knowledge of all Baltur products.